Used to viewFlash Player 9 or higher. The prevalence of urinary tract diseases and disorders in small animal practice is higher than ever. 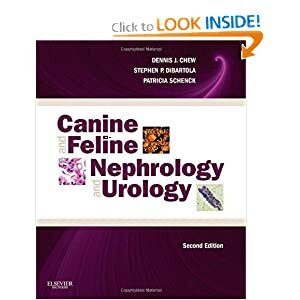 The 2nd edition of Canine and Feline Nephrology and Urology makes it easy to find the information you need to accurately diagnose and manage diseases and disorders of the urinary tract in dogs and cats. Its concise outline format features practical clinical content, line drawings that clearly illustrate the initiation and progression of disease, photographs that demonstrate the clinical appearance of various lesions, and tables and boxes that offer essential information at a glance. Expert authors Dennis J. Chew, Stephen P. DiBartola, and Patricia Schenck keep you current with revised and brand-new content based upon the latest studies and evidence-based medicine, helping you prevent and most effectively manage kidney, bladder, and related conditions. Congratulations to the 2011-2012 UF Doctoral Mentoring Award Winners!